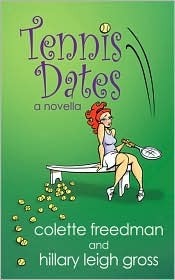 "Charming and Hilarious" - A reprinted TENNIS DATES review from Chick Lit Central - Colette Freedman is a top Hollywood Script Doctor who has also ghost written several novels. Ever had a bad date? A really bad date? Like, your tennis partner decides to be ultra competitive and play Wimbledon-level tennis during what’s supposed to be a friendly rally? Or they decide that Bud Light is actually a much better hydrator that Gatorade or water? Nora has. But she keeps fearlessly throwing herself out there, confident that one day she’ll find her perfect doubles partner and all of a sudden “love” won’t only mean ”zero” in her life after all. In “Tennis Dates” by Colette Freedman and Hillary Leigh Gross, we meet Eleanor (Nora) Gold, a 27 year-old lawyer who is looking for a number of things, and we quickly learn that Nora is struggling. She’s struggling to pass the bar, she’s struggling to find a date that’s even halfway normal, and she’s struggling with who she really is. What easily could have been a disastrous diatribe on the worst dates ever is actually a delightful novella where you really end up rooting for Nora to find true happiness, whatever that may be. To find Mr. Right, Nora sets up an online profile and decides to screen her potential suitors by inviting them to play tennis. She assumes that a fellow’s tendencies on the court will translate well to off-court manners, which leads to a hilarious list of deal-breakers that she applies to subsequent dates. To add to her frustration, Nora has always known what she’s supposed to be: happy, successful, and a lawyer. Her father is a lawyer, and she’s always felt that she would follow in his footsteps. So when she finds herself single, and realizes that she failed the bar exam, she is given the opportunity to dust herself off and re-examine her life. I really liked the character development of Nora. The narrator was introspective enough that we learned a lot about who Nora was, and why she was that way. Her best friend Phoebe provides a hilarious foil to Nora’s level-headedness, as well as a shoulder for Nora to lean on when things don’t go as planned. Nora also manages to bring a thread of positivity and humour into almost all of the situations that she ends up in. It was a lot of fun to read a book in which the main character doesn’t wallow in self-pity when things don’t go her way. Nora would simply look at the facts, decide what she could and couldn’t change, tweak the variables, and try again. That being said, there may have been an opportunity for a little more branching out into other characters to be developed throughout this novella. I found myself wondering more and more about Phoebe, and hoping for more information about her as the story continued. The danger of writing in first-person is that the story becomes a linear narrative, and although there were some details given about other characters, I would have liked learning more about some of them. This novella was the perfect length. At 136 pages, it told the story of Nora and her search for the right choices concisely and effortlessly. There weren’t a lot of wasted words, and the end felt like somewhere the story could naturally leave off without trying to fill a word quota. I was very impressed at Ms. Freedman’s and Ms. Gross’ abilities to tell this story and make it appealing, inviting, and never feel bogged down with unnecessary details. As well, it was a nice easy read. It was a fun little story that rolled along comfortably and came to a soft stop at the end. Charming!